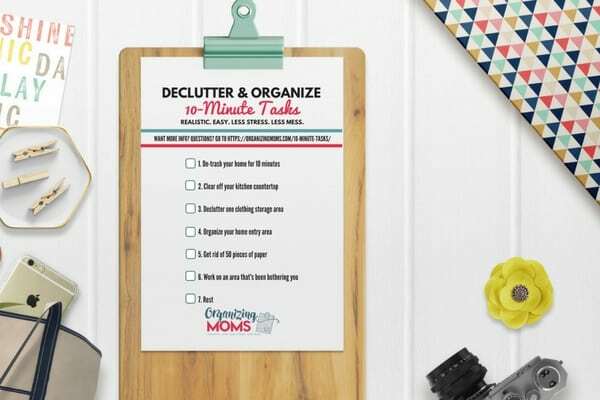 Welcome to the 10-Minute Tasks System from Organizing Moms. I’m so glad you’re here! 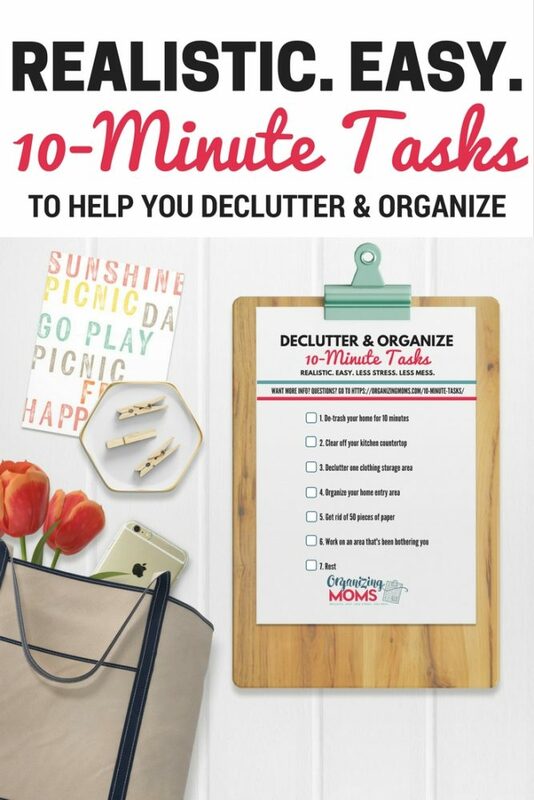 Here you’ll find realistic, easy 10-minute tasks to help you declutter and organize your space. This system was designed for moms who need less stress and less mess in their lives. 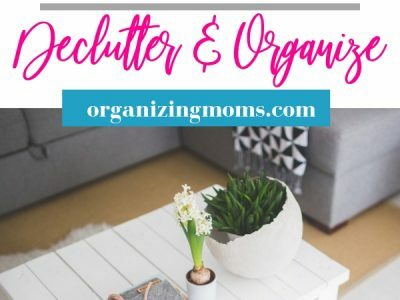 Click here to sign up for free decluttering and organizing checklists. 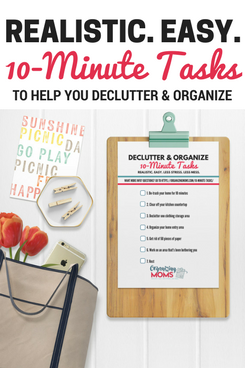 Every week you’ll get a checklist of seven 10-minute decluttering and organizing tasks. Sign up here to get the checklists emailed to you. They’re free. Download your checklist and print it out. If you’re a digital person, you can save it to your phone or your computer if you want to! When you get the checklist, read it over, and then EDIT it to make it suit your needs. 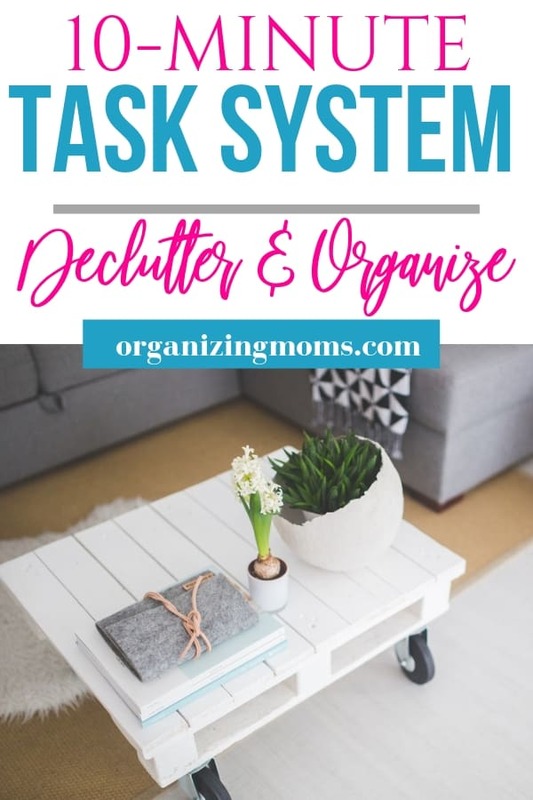 For example, if one of the tasks is to declutter your socks, but you seriously only have 7 pairs of socks and you don’t need to declutter them, cross that off your list and put a different task in its place. Schedule when you’ll do your tasks for the week. You can do this in your calendar, or just write directly on your checklist. Put your checklist up somewhere where you’ll see it! You can do the tasks in any order you want. There is no magic to the order in which the tasks are presented. The secret sauce = doing something every day. And yes, you get a rest day each week, and it definitely counts as doing something. Why only 10 Minutes a Day? Because spending hours upon hours decluttering and organizing is exhausting. And most of us just don’t have time for it. Just jump in and start! Start where you are. Start right now. Start making progress! What if I want to work for longer than 10 Minutes? Go for it! Just don’t let yourself get overwhelmed or worn out. Only take out what you can easily put back within 10-15 minutes. Will 10-Minute Tasks work for you? You’re not willing to do the work for 10 minutes a day. You get caught up in the details. The secret sauce is doing something that will move you forward every day – not following the task recommendations to the letter. You have an all-or-nothing mentality. This system is NOT an instant fix. You can commit to 10 minutes a day. You can be flexible and make this system work for your needs. You focus on PROGRESS, not perfection. Ready to get started? Sign up below to get your first 10-Minute Tasks Checklist!